Awarding Ceremony for Men's Team Division Under Way in Puebla, Mexico: An awarding ceremony for the men's team division is under way during the closing ceremony on the seventh and final day of the 2013 WTF World Taekwondo Championships at the Exhibition Center in Puebla, Mexico on July 21, 2013. Korea took the men's overall title, followed by Iran, Mexico, Russia and China. South Korea showed its supremacy in taekwondo as it took home both the men's and the women's overall titles at the 2013 WTF World Taekwondo Championships in Puebla, Mexico on July 21, 2013. The biennial championships took place at the jam-packed 6,000-seat Exhibition Center Puebla, drawing 950 athletes from 134 countries. The seven-day event attracted great interest from both the international media and the home fans. Tickets for the second and third sessions of the championships were sold out every day during the championships, showing the high popularity of taekwondo in Mexico. At the previous 2011 World Taekwondo Championships in Gyeongju, Korea, Iran grabbed the men's overall title. It marked the first time that Korea failed to retain the men's overall title in the history of the biennial World Championships. China won the women's overall title at the 2009 World Championships in Copenhagen, Denmark, the first ever in World Championships history. 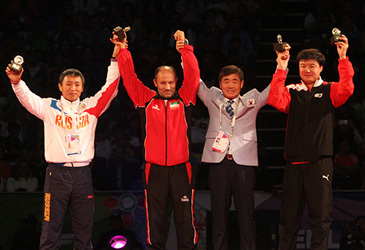 In the men's division, Korea garnered three gold medals, one silver medal and one bronze medal for a total of 60 points, followed by Iran with one gold and two silvers for 48 points. Host Mexico came next with one gold, two silvers and one bronze for 47 points, followed by Russia with one silver and one bronze for 31 points, and China with one silver for 30 points. In the women's category, Korea clinched three gold medals and two silver medals for a total of 61 points, followed by Russia with one gold and one silver for 32 points and France with one gold and two bronzes for 29 points. Cuba came next with one gold and two bronzes for 27 points and Australia with one gold for 22 points. Korea's Dae-hoon Lee, the gold medal in the men's -63kg, was selected as the male Most Valuable Player (MVP) of the championships, while Russia's Olga Ivanova, the gold medalist in the women's +73kg category, became the female MVP. The Good Fighting Spirit Award went to Cote d'Ivoire, while the Active Participation Prize went to Colombia. The Best Referee Awards went to Iran's Shahram Arbadi, the Philippines' Roland Gayo Campos, Mexico's Nubia E. Segundo, Belgium's Abdelhak Chbibi and Great Britain's Christopher Codling. Mexico's Young-in Bang was chosen as the best male team coach, while France's Myriam Baverel was selected as the best female team coach. The newly created female Fair Play Award went to Italy's Leonardo Basile and the male Fair Play Award went to Croatia's Ana Zaninovic. On the seventh and final day of the World Taekwondo Championships on July 21, Australia's Carmen Marton earned her country the gold medal in the women's -62kg division. With two seconds to go to the final whistle, Marton successfully made a turning kick to the head of Korea's Hwi-lang Kim to make the score 7-3 for the gold medal. Marton advanced to the final round as she defeated Germany's Rabia Guelec 7-2 in a semifinal match. Korean Kim made her way to the final round as she beat Switzerland's Nina Klaey, the bronze medal winner at the 2013 German Open, 8-4 in a semifinal match. In the men's -80kg weight division, Germany's Tahir Guelec brushed aside a stiff challenge from host Mexico's Rene Lizarraga to win the final match 8-7 for the gold medal. The German reached the final round by edging down Russia's Anton Kotkov in a fourth sudden-death round, while the Mexican made it to the final round as he defeated Spain's Nicolas Garcia, the silver medal winner at the 2012 London Olympic Games, in a fourth sudden-death round. Steven Lopez, the gold medalist at the 2005, 2007 and 2009 World Taekwondo Championships, failed to advance to the semifinal round as he lost to Mexico's Rene Lizarraga 8-5 in a quarterfinal match. Aaron Cook of the Isle of Man lost to Poland's Piotr Pazinski 13-11 in the round of 32.